In the end, we were all looking the wrong way. The story wasn’t about a player seeking his first Major at 40, or redemption from years past, or the laying of professional ghosts, or an improbable charge through the field, or any other third-rate TV-movie-of-the-week plotline. It was about the guy in form, who played the best golf at the most crucial time. It was about the man who decided Castle Stuart was the perfect preparation for The Open, and received his reward twice. It was about the player who captured his debut career victory on British soil there; and then came to Muirfield to make it two titles in a row – the first player in history to win the Scottish Open and The Open in consecutive weeks. It was about the only competitor capable of finishing the Championship below par on this extraordinary course. In short, it was about Phil Mickelson. Some will find a redemption storyline in there somewhere, probably about this win making up for the “heartbreaking” sixth second place of his career at the US Open, just a month ago, and on his 43rd birthday to boot. They may cite the tough times his family has known, with his wife and mother both diagnosed with breast cancer within weeks of one another during that horrible period in 2009. These would be powerful times in anyone’s life. No doubt all of it – and, more importantly, much, much more, private times we have not seen – crowded his mind, to judge by the wall of emotion which clearly engulfed him when he sank the putt on 18. 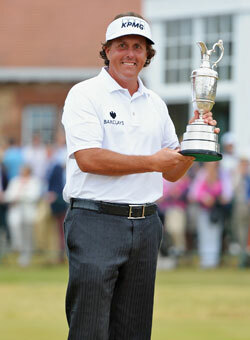 Even with five groups still out on the course, everybody – especially he – knew he had clinched the 2013 Open Championship. When that eight-footer dropped, there was such elegance, such dignity, in the slow repeated clench of his fists over his head, eyes shut tight to contain the tears, as if he were a small boy. There were such volumes of mutual understanding in his gruffly silent embrace with his caddy these last 20 years, Jim “Bones” Mackay, neither man trusting himself to say too much in that extraordinary moment – one of those utterly public, intensely private images which it is sport’s unique capacity to yield. These are the sights which define the great victories, these moments between those most closely involved, who know far more than we who watch ever can about the price that has been paid, the cost of the greatest triumph in golf. So this year The Open belongs to Phil “Lefty” Mickelson, the player whose story does not oblige cheap headlines; the right-hander who plays left-handed; the right man at Muirfield 2013.